Apologies apologies! I have neglected you guys in your hour of need: Summer Movie Season!! I promise that I am in the midst of new exciting posts!!! In the meantime I would like to just say a few words about that poor victim of all film critic's wrath" The Mummy: Tomb of the Dragon Emperor." To all those critics who contributed to the film's 12% rating on Rotten Tomatoes I would like to ask: "What did you expect??" 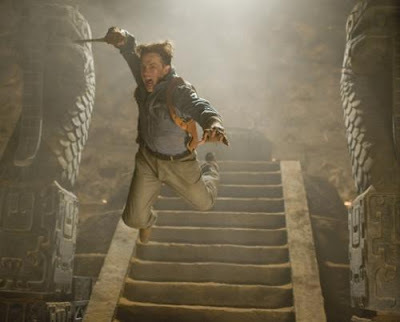 For all of us who enjoyed the first two mummy movies, the one liners, yaks yakking gags, Brendan Fraser swashbuckling and laughably bad CGI are just what we wanted. Add Jet Li, Anthony Wong and Michelle Yeoh and I am just peachy! Giant CGI terracota army: check! Skeleton army rising from the depths of the great wall to seek revenge: I'm so there. The Mummy: Tomb of the Dragon Emperor is a summer film and nothing else. It does not strive to be anything but. As a pairing try Richard Brooks western The Professionals starring Lee Marvin. The connection: they are both tons of fun. And when its 95 degrees outside, thats enough.